From our sites in Friedrichshafen and Rodermark near Frankfurt, we provide QM services to a wide range of industries, including aviation, automotive, mechanical and plant engineering. As an organisation that specialises in production and maintenance, and working with well known companies such as Rolls-Royce, Lierbherr Aerospace, EADS Germany and ZF Luftfahrttechnick, we have all the vital approvals and knowledge of the requirements needed in your industry. As well as providing destructive and non-destruction testing, we also help carry out demanding measurement tasks and are known for our excellent calibration service. 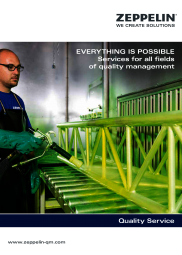 With our long history of producing high quality and consistent welded structure from aluminium, we can develop you the most appropriate QM system for your business and guide you through to certification. From carrying out an as-is analysis, implementing workshops and internal audits, Zeppelin are the perfect professional partner to help grow your business.